My grandmother was a poet. Squarely in the sentimental Victorian tradition, her poems were published in Scottish and Canadian newspapers and small-press collections in the late nineteenth and early twentieth centuries. I have several fat notebooks filled with her poems, handwritten and pasted in from print sources. Years ago I read my way through them as a way to know the woman who had faded a bit in my mind (I was five when she died). I read most of the poems, but honestly, only one stands out in my mind. It began, "Farewell, my noble friend, farewell," and even now I can’t think of it without feeling the tears well up. The copy in the notebook was yellowed and frayed at the edges. On the facing page was a clipping, a picture that had run in the Drumheller, Alberta, paper and, I’ve learned, many others. 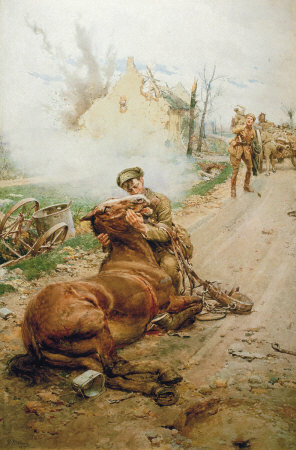 It immortalizes the death of a war horse and the grief of his soldier at his death. 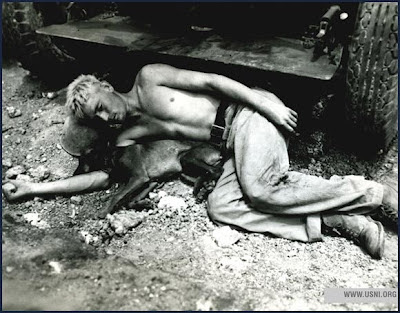 This image, long ago burned into my psyche, is a big reason that I have no desire to see the movie War Horse. I didn't know it at the time, but Italian illustrator Fortunino Matania not infrequently focused on the sad deaths of animals, especially horses, in the war. Today is Memorial Day in the United States. This holiday, celebrated on the final Monday of May each year, is meant to honor those who have served in the American military. Originally May 30 was known as Decoration Day because one tradition of the day is the decoration of the graves of veterans, a practice that began during or just after the American Civil War (1861-65). The first official observation of remembrance was May 30, 1868, when flowers were placed on the graves of both Union and Confederate soldiers at Arlington National Cemetery in Virginia. By 1890, all Northern states had adopted the holiday, but most Southern states refused to do so until World War I, when the holiday was extended to honor the dead of all American wars. Books have been written on animals in war, so I won’t attempt any kind of thorough commentary. Instead, I give you a few photos and a few links to more information, and ask that, as we remember our service people, we also remember the animals. I can't think of an animal more suited by nature to peace than the equines, and yet horses, donkeys, and mules have been used in human warfare since, probably, the first person threw a leg over an equine's back. Without horses for speed and donkeys and mules for stamina, we as a species would certainly not be where we are today, and our history, especially the history of conquest and war, would have unfolded very differently. Horses, mules, and donkeys naturally became less important to most militaries after World War I, but they aren't out of the service entirely. In fact, they are being used by American forces today in Afghanistan, as shown on Olive Drab's page. Carrier pigeons have nearly as long a history in military service as do the equines. During World War I, the U.S. Signal Corps deployed at least 600 pigeons in France alone, and Britain used some 250,000 carrier pigeons during World War II. Paddy, an Irish carrier pigeon, was the first pigeon to cross the English Channel with news of success on D-Day. One of hundreds of birds dispatched from the front, Paddy flew 230 miles in 4 hours and 50 minutes. 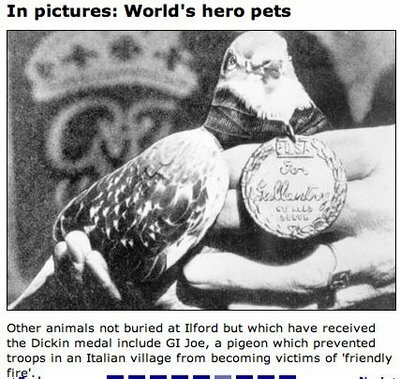 He is one of 32 carrier pigeons to be awarded the Dickin Medal, the highest British decoration for valor given to animals. Another recipient was an American pigeon, GI Joe (below). The PDSA Dickin Medal, recognised in Britain as the animals’ Victoria Cross, is awarded to animals displaying conspicuous gallantry or devotion to duty while serving or associated with any branch of the Armed Forces or Civil Defence Units. The Medal has been awarded to dogs, horses, pigeons, and one cat. The citations on the Rolls of Honour are moving tributes to the role animals play in our service during war, and to the courage of the individual animals who have received the medal. No such medal exists in the United States as far as I know (please let me know if I've missed it in my search). In fact, in 2010 the Pentagon refused the request of military dog handlers to establish an official medal for valorous animals. Although we tend to think of dogs and, sometimes, horses when we think of animals in the military, cats have also served in the military, often in the navy, like Pooli (below). 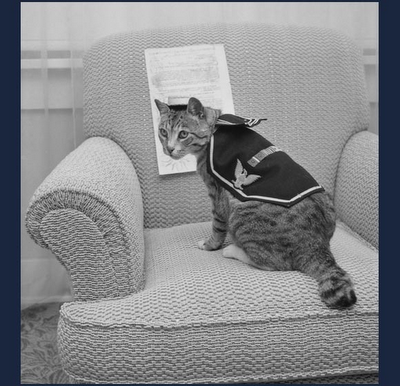 For more great photos of cats in the Navy, visit Cats in the Sea Service . Dogs, too, have served aboard ship, often as ship's mascots and de facto therapy dogs. 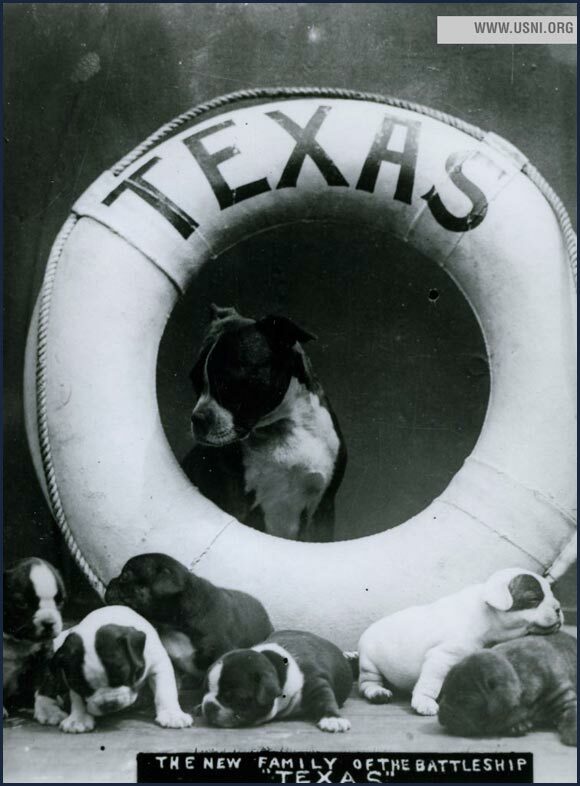 Imagine how much fun the sailors on the USS Texas had with this gang in 1915. The Texas is now a museum near Houston and has been designated a National Historic Landmark. It is one of six surviving ships to have seen action in both World Wars. Check out the U.S. Naval Institute's Sea Dogs page for more canine sailors. Not all who serve fight, of course, and just having an animal to touch, to care for, and to love can be vital to a service man's or woman's emotional health. 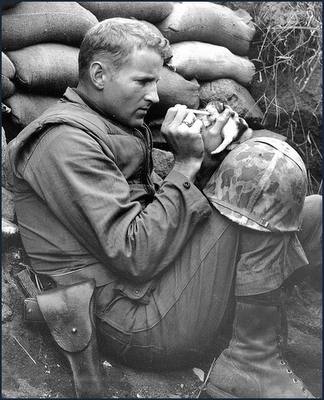 "Accepting her fate as an orphan of war, 'Miss Hap' a two-week old Korean kitten chows down on canned milk, piped to her by medicine dropper with the help of Marine Sergeant Frank Praytor ... The Marine adopted the kitten after its mother was killed by a mortar barrage near Bunker Hill. The name, Miss Hap, Sergeant Praytor explained, was given to the kitten 'because she was born at the wrong place at the wrong time'." As you prepare for your cookout or whatever else you have planned for the holiday, please take a moment to pause and remember what it's really about, and raise a glass to the all the souls - human, canine, equine, feline, avian, and more - the day is meant to honor. Thank you for always remembering our furry and feathered friends! You're welcome, and thank you for commenting. There is much, much more to say on the subject, but this will do for now, I think. Thanks, Helen. Maybe we should spend a few hours with laptops in a coffee house when I'm in Maine! I found this article very moving, Sheila, strangely and particularly the part about carrier pigeons. No one gives birds much thought, and pigeons are considered particularly stupid by some, but their power to think is not at stake when they work, their lives are, whether they know it or not. It doesn't matter if they are actually brave or not, what matters is that they did their job and did it well. Thank you for sharing this with us! The costs of war are always so much higher than we can easily comprehend. This is a great post Sheila, thanks for remembering our war serving animals. 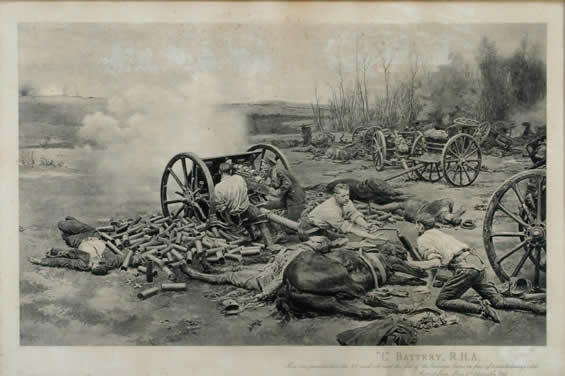 One of the saddest things I learned doing some of my own research was the callous destruction of cavalry horses and the destruction of 'war dogs' who were done their service to their country. I'm glad we are working to get past that with our service and working animals.